Towards the middle of the sixteenth century powerful noble Venetian families thought to invest the wealth accumulated in the trade with the East in the creation of agricultural enterprises in the mainland; so did the Corner, Barbaro, Emo, Grimaldi ,etc. who were power holders but also art lovers. Thus was born the Venetian Villa, a type of dwelling and original production, which had great success because it responded to esthetic and practical needs; In fact, next to the main building, that housed the patrician, built by renowned artists, stood the barns, stables and cottages. Initially, all the Villas were built in contact with nature and had as the primary goal the investment for intensive agriculture and only later the Villa took on a character of a vacation home, also becoming a kind of status symbol. Over the course of three centuries, several hundred villas were built in the countryside of the Veneto region and along the main rivers. Among the most famous, Villa Maser, designed by Palladio and frescoed by P. Veronese, Villa Emo and Villa Foscari, called “Malcontenta”, frescoed by Zelotti . 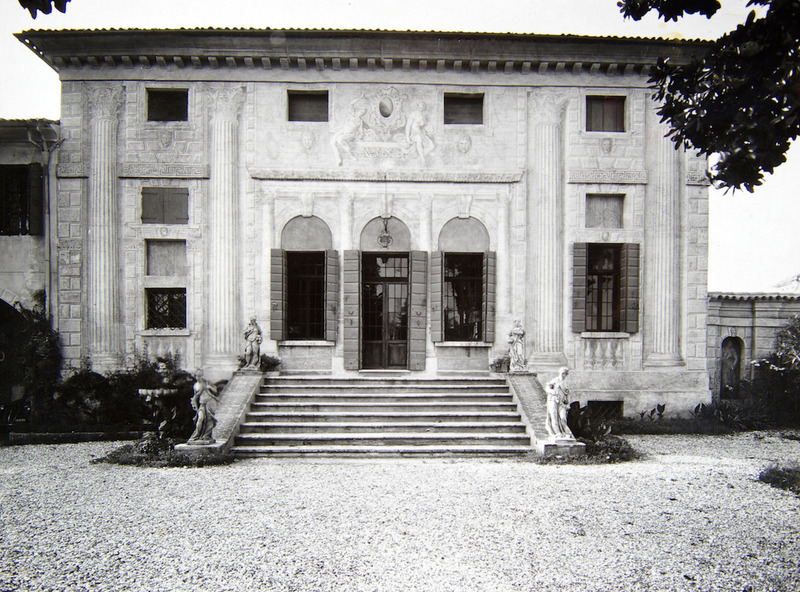 Among the most fascinating, though less known, Villa Soranzo Chiminelli in Sant’Andrea di Castelfranco Veneto. Lovely building of the second half of the sixteenth century, frescoed on the outside and on the main floor by Benedetto Caliari, Paolo Veronese’s brother, and his school. The Villa was built on an earlier “domus” mentioned in a deed of partition in 1477, already documented in a map of 1598 and cited by historian B. Scapinelli in “Historia di Castelfranco” (1623). Recent studies show that the original property, “in origin attributed to the Corner family,” was indeed of Francesco Soranzo, noble Venetian, pastor at St. Andrea oltre il Muson from 1563 to 1595. In 1614 The villa passed to the noble family Piacentini and later on, in 1852, to the Tiepolo family. During the second world war, in 1944, the Villa was occupied by german armed forces who used the house as a military hospital, and later under the american command. It was in this last year of the war that the whole property was bought, in very poor conditions, by Francesco Chiminelli who, whith great enthusiasm and passion, gave way to a restoration project p the close supervision of competent bodies. The first refurbishment of the inhabitable premises was followed by the restoration of the frescoed walls still partially covered by lime. He is also responsible for the collection of objects that today are part of the Museum of peasent art and the tanning. After Francesco’s death his sons Alessandro and Baldino, with the spame love and passion of their father, have embarked on a new, important and accurate restoration work, restoring the Villa to its former glory.